Man Ting - my colleague, my buddy, a new mom-to-be - is 6 months pregnant now and we share quite a bit on pregnancy, labour and baby care. She ever asked me if I buy toys for Kady. Of course every parent does! But selecting toys are subjective to individual. Here's a 'showcase' of Kady's toys from birth till now at 9 months. This handsqueeker - Sheriff Horse - gives fun and entertainment to Kady. It is soft to hold and fun to squeeze (make a “squeeky” sound when squeezed); made in fabulous fabrics and available in a range of cute animal designs. They can be creatively used to make 'knock-knock' noise or as stackle blocks for knock down! The orangey-peach poky ball made him chuckles as it bounced above his eye-level; Kady also loves to kick it. The other intertwined-like ball is a rattle ball and also a bath ball! The small ones are just perfect for his little hands now; passing from one hand to the other. 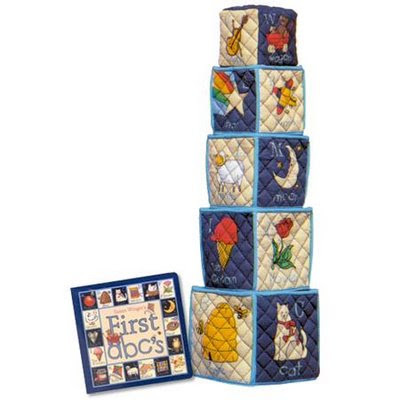 This nesting, stackle blocks come in classic design, soft touch, crafted of fabric quilting, with bound edges and colorful alphabet graphics. It also come along with ABC's boardbook; folk art by Susan Winget provides simple graphics and bold colors. Largest block is 5"x 5" x 5". Smallest is a filled block that tucks in or stacks on top. This play gym freed my time from Kady as he can self-entertained by the colourful animals and with ruffled sound and music. He has his favourite character which is a blue elephant called Enphant. I have been using this play gym since his birth. Over 15 songs and melodies! this soft learning pal is truly a multi-sensory learning experience with tons of activities for baby to touch, hear and see! With 4 modes of play, this pal musically introduces counting and colours, while offering a variety of different classical tunes. The Baby Counting Pal also offers an assortment of tactile activities that include: a bird squeaker, butterfly rattle, crinkly bees, flower rings and a ladybug bell for the very young explorers. Product includes attachment straps for parents to attach this toy just about anywhere, as well as include a carry handle for on-the-go fun! The Baby Counting Pal is the perfect pal for learning on the go!